Adirondacks flavor bright, AMAZING NOW with Spring popping forth everywhere! 7 acres of peace and privacy w/ lake at the end of the driveway. Spacious all wood 4 bedroom (3 queen beds and 2 twins) authentic Log Home with skylights and windows that let in the wonderfully landscaped seven acres of Perennial gardens and expanses of lawn surrounded by mature hardwoods, -- hemlocks and all kinds of other species of pine and deciduous evergreens, oak, beech, mountain laurel, birch and multiple misc. shrubs and berry bushes. No other homes crowd this quiet, peaceful getaway. At the end of the long gravel driveway (with evergreen on one side and a high landscaped berm on the other) sits pristine, crystal clear spring fed 125 acre Winchester Lake reflecting surrounding woods —and paved boat launch directly across from your driveway to the Log Home. Two kayaks have a clever cart ( that two people can easily push down to the lake and back). Now they are up on racks so guests can use the 2 car garage under the master bedroom. Up one step is a large walkout basement -- washer/dryer with oil hot air furnace, 2 new electric hot water heaters, and a/c. This magnificent lake is surrounded by Mountain Laurel and no visible homes. Motors over 7-hp not welcome so your, fishing and kayaking are quiet and safe. Amazing ice fishing just ending.. 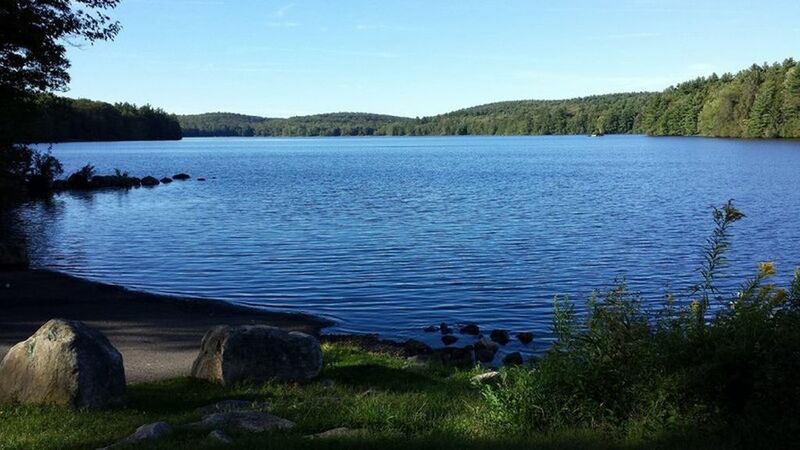 Numerous State Parks are in the surrounding 5 miles; Burr Pond has a nice beach on a beautiful lake with Forrest trails and picnic pergolas. Mohawk Mtn. Ski area half hour away. Sophisticated Norfolk with music concerts, Saturday morning Farmers' Market and Infinity Hall, 7 miles away. Famous Music Mountain is nearby-- Limerock Speedway only 30 minutes further. Picturesque Kent, Sharon -- and canoes are available to rent on the Housatonic River. Farmington River — thrills for every age with tubing you'll never forget. Kent is a very appealing art center full of great shops food and tourist attraction. The Norman Rockwell Museum in beautiful Stockbridge is a real "must" family affair. That town houses a stunning botanical garden and is a joy to stroll about; choices of great dining everywhere. There is skiing in Pittsfield and Great Barrington is a neighboring town also with a delightful choice of unusual shops and eating places. You can be young and adventurous or senior and crazy about all kinds of interesting pastimes and fit right in. I never go anywhere without my beloved chocolate Labrador, Sadie, and she did live in the Log Home for several years. So I know from experience this is a wonderful home to bring your dog. The lake is an incredible place to throw balls and sticks for water-loving pets. Choose one spot in the woods surrounding the lawns as a Poop Place. You can walk the dog off leash all around the house and on the many trails behind the house But please pick up after your pet before you leave — insidetoo, if it has coated the house with its hair, please make an effort to minimize it. I don't want to charge extra for a dog, so please do your part to leave nothing behind except its sweet aura. We are an older couple happily married over 40 years. Pete is still actively involved in our growing business (see CTPOSTANDBEAM). Our large, beautiful family is scattered over the east coast, close enough to enjoy our grown children all of the grand and great grandchildren. The only one still at home is our precious chocolate Lab, Sadie, our fur baby. I am fully involved in keeping up the endless perennial gardens at the log house and our small, 100 year old "garden of eden" that we were fortunate enough to discover, only a mile from the log home. We were able to downsize into that dream cottage where I can garden endlessly with Sadie by my side. My other interests are drawing, biking, serving as Literacy Volunteer and with visually impaired. Pete continues to be a full-time businessman selling post and beam plans, connectors, and tooling all over the US, Alaska and other countries. The large 3-bay barn set away from the house is where Dennis Royer, Pete’s assistant packs and ships the tooling and connectors. He and Pete hustle while the guesthouse is unoccupied but try to stay away when you are there unless there is need for something to be done at the house that can’t wait. Wonderful Sarah mows lawns once a week but tries not to come early in the morning. I try to text or call guests when I know she is coming in case children or pets might be outside. Occasionally a customer of Pete’s will find he is in the middle of a large construction 🔨 project and is short half a dozen pins or a tool he wishes he had bought in a timely way; Dennis or Pete will slip quietly into the barn to wrap the precious part (to him) and ship it. We will try to make sure the UPS truck doesn’t come when you are there, shipping at the UPS store instead. Honestly, it feels as if you have finally arrived in the Adirondacks at the cabin you reserved. We did that once and that was what appealed to us the most about the house you're going to stay in. You just never want to leave, and many of our guests choose to return. You can sit quietly and read a book, play yard games or card games, hike in any of dozens of grand trails from gentle to wild, in safe, but wild State Parks, all within 20 minutes of home. Culture, class, sophistication or plain old country close by. Sports car or bike enthusiasts-- come one come all. The NW corner of CT has it all. One larger master bath with shower in tub, two sinks, linen closet. Window looking out at acres of mature woods. You will have to hold a large shell to your ear if you crave the sound of the ocean. Unless you want to drive two or three hours east and north. Multiple fine parks within 50 miles could keep amateurs and pros busy hiking all year. Infinity Hall in Norfolk has professional entertainment for every fancy, and a great meal before the show. Grange Hall and little green are all that can be called the Village of Winchester Center.... we get our mail in boxes at the Grange. Norfolk a few miles north is lovely and has endless fine music. Lake view from top of driveway. Two almost new kayaks w/fine paddles in garage; cart designed for 2 to move.. No noise or danger; 7hp motors largest allowed so no skidoo or water skiing keeps peace. I hear there is a lovely golf course in Norfolk...also Litchfield and many others nearby. Haystack Mountain and Campbell Falls in Norfolk -- and Dennis Hill, built on a volcano with a four state view are only a few of dozens of CT State parks nearby. Mohawk Mtn, past Goshen about 15 mi. WE ARE NOT OCEANFRONT nor LAKEFRONT our driveway runs from boat launch up to Log House, About 800' Google map incorrectly places loghouse...not that it matters. The log house is at the end of a long driveway across from the boat launch, not as appears on google map. That driveway was the beginning of Blue Street but the road was ended at our house. Two new sets for each bed. Plenty of pillows and blankets. Downstairs in walkout room adjacent to two car garage. Large, bright plenty of couch room, and TV. Regular gas oven automatic start. Complete for ordinary use. Plenty of dishes, utensils, pots and pans, baking, Blender, toaster, etc. A selection of mysteries and general reading. Some wonderful old children's books on shelf in guest room. Small deck upstairs off sun room. Old fashioned log cabin front deck with entrance to walkin closet entry room and also on other end to master bedroom. Beautiful clear 125 acre lake just at the end of the driveway. People swim and fish and there were no power boats or noisy watercraft. The kayaks are lovely on that lake and in spring the mountain laurel completely surrounds the lake as there are no structures there at all. My friend and I, and our puppies, had the most relaxing four days here. The house is awesome with everything you could want. We spent our days at the lake or chilling in the back yard, watching the puppies run around the garden while we cooked on the bbq. Cell service was sketchy but to be honest it was nice to unplug. Arlene and Pete could not have been lovelier. We hope to return! This was a beautiful cabin, on a wonderful property complete with a fabulous butterfly garden. We loved sitting out on the front porch to watch the hummingbirds flying around the flowers, and drinking coffee in the screened-in back room with a balcony over the fire pit. The set-up of the rooms was a little strange, and did not allow for too much privacy, so it might be be especially best for a family (the rooms are mostly all connected by doors that could be seen through, and unless you go outside, some rooms require walking through others to get to the rest of the cabin). With the beautiful weather allowing us to go around outside, and with the use of a strategically placed blanket over a door, we managed to make it much more private, and it was no problem! We also LOVED the short walk down to the lake, where we enjoyed kayaking in the day, and Star-gazing at night. However, the real treasures of this cabin are its hosts, Arlene and Pete. They were so attentive and generous, from being available to answer our every question to bringing us extra firewood so that we didn’t have to leave for errands. They were so eager to help, and we were just blown away by their kindness and warmth. Pete’s workshop is on the grounds, and we did notice him coming and going (so again, a little less private than we may have expected), but when we saw him, he gave us wonderful information and advice about the property, and even showed us around his workshop! I imagine that if any visitors ever had any problems or concerns with privacy or anything in the cabin, a quick text to Arlene letting her know would have them doing anything in their power to make things perfect for you. We had a wonderful time, and would absolutely recommend this cabin to others looking for a peaceful retreat on a beautiful property owned by a truly gracious couple. There are so many wonderful details to This house, our week in the log house was great. Perfectly placed on park like grounds, private with all the summer details you need living by the lake. Kayaking and fishing by day, or swimming, and fire pits and s’mores at night. The owners were so gracious sharing their favorite dining spots and best tomatoes and sweet corn farms. We loved our week in this modern up to date home with all the amenities at your fingertips, can’t wait to visit again . Peter and Arlene were the loviest couple, and their beautiful home is a hidden gem in CT. Private, secluded, beautiful grounds. Short walk to lake for swimming, fishing, or boating. House was great, very cozy and well stocked. Owner was so nice, came by and brought us a ton of wood for the fire pit and made sure we had everything we needed. Would definitely stay again. Really enjoyed our stay! Was a great experience at a great place! Arlene was a pure delight! A great cabin, great location, great owner! Don't think we could say enough great things about our experience. We are blessed with really great guests like Amy and her family — and welcome pet! Beautiful home-inside and out! Great location and easy to make day trips. Carol, my dear guest....you have filled me with joy and satisfaction. Hearing your kind words, knowing you were pleased and happy in The Log House is a gift I cherish. Please come back if it works out, and, please, give me a chance to meet you! Pete and I wish you a healthy and happy holiday season. is a tremendous joy year round. Just walking down to the lake from the house and across the dam and back refreshes a person anytime of the year. It is so beautiful and each season has its own splendid show. An hour drive takes one up into lovely town in MA, to every avenue of entertainment from the Rockwell Museum to an amazing stroll around Stockbridge. It seems that every town in New England dresses up between Thanksgiving and Christmas, holds special events from fairs and holiday shows to towns like nearby Collinsville which has closed streets so the whole neighborhood can stroll about and experience the special pace of that treasure right outside of Avon and Canton. Summers are amazing with wild and exciting tubing on the Farmington and housatonic rivers. Never mind the fishing!!!! There must be at least a dozen spectacular Fairs spread out from Spring to Fall, sort of culminating in the huge Springfield exposition, and experience one would remember for sure. With the ever changing seasons, and the ever changing weather in each, life is never boring in New England and it is always so so beautiful.